In addition to a high quality oil, every engine needs an oil (lube) filter to help keep it running efficiently and preserve its life. The purpose of an oil filter is to promote long system life by keeping damaging contaminants away from sensitive engine components. While motor oil lubricates the engine, the oil filter stops the solid deposits from reaching critical engine parts. These deposits can result in dangerous levels of engine wear. 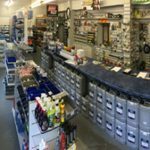 We all know that as oil passes through the engine, it lubricates such parts as the valves, cylinder walls and pistons, camshafts and connecting rod and crankshaft bearings. As the oil flows over these various parts, it picks up small metal particles, dirt and other types of harmful grit. A good quality oil chemically holds these harmful deposits in suspension until it reaches the filter, where the deposits are trapped and removed from the circulating motor oil. Ingested. Those that enter with the fuel, air or oil. Built In. During the assembly of the engine, some dirt will be left in. Core sand is relatively common. Created. As the engine runs, friction between moving parts causes minute pieces of bearings, cylinder walls, pistons, etc. to break off and circulate through the fluid stream. Particles that are the most damaging are in the 5 to 20 micron range. To put this in perspective, the thickness of a human hair is about 50 microns in diameter. By-Pass filters — with a by-pass system, about 10 percent of the oil flow is finely filtered and returned to the sump where it sweetens the dirty oil. It’s a continual process and within minutes all the oil is filtered. Full-Flow filters — with this system 100 percent of the oil is filtered before it reaches the bearings. It is less restrictive and more free-flowing than a by-pass filter and should remove all particles large enough to cause immediate damage. Dual-Flow filters — with this method, all oil is continuously filtered by the full-flow filter before it reaches the engine’s critical components. About 10 percent of the oil is diverted to the by-pass filter where it is scrubbed of fine contaminants. Oil from the by-pass is then returned to the sump. Efficiency. 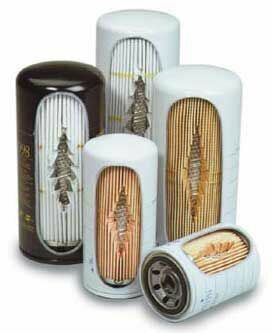 The filter’s ability to trap contaminants within the range of sizes most likely to cause engine wear and damage. Capacity. The amount of contaminants the filter media can hold before the pores begin to plug and interrupt proper oil flow through the filter. Service Life. The length of time the filter can successfully perform its functions of trapping and holding contaminants. Service life is dependent upon the capacity and efficiency of the lube filter. Efficient oil filtration and regular servicing can reduce wear, guard against system failure and promote maximum equipment performance.